I love football. It’s been part of my life as long as I can remember. Growing up with a father who roots for the 49ers in my home state of California, I distinctly remember us speaking the name Joe Montana in hushed tones. While I personally am not a fan of the Philadelphia Eagles – I’m actually a Giants fan, having lived in Connecticut for 16 years – I do have a deep appreciation for what they accomplished this season. Personally, I spent the season waiting for it to be over, as my quarterback – and our captain – was booed by fans, criticized by the press, and eventually even demoted and benched by his then-head coach. It was a painful season for me as a fan. What I appreciated about Eli Manning’s character is actually something that I have come to appreciate about our arch rival Eagles and their coach: his emotional intelligence. Experts define emotional intelligence as “the capacity to be aware of, control, and express one’s emotions and to handle interpersonal relationships judiciously and empathetically”. As a leader, it means also being able to identify, assess, and manage the emotions of others, including those of your team members. It’s hard enough managing your own emotions, let alone those of the people around you. No one can argue that Manning handled an ugly season with anything less than class. His performance was abysmal and it didn’t improve as the season wore on. His demeanor never faltered, though. He didn’t argue, he didn’t question his superiors in public, he answered every question the press posed to him, and he never outwardly objected. His one goal was to keep the team focused, even as their postseason dreams disappeared. He controlled his emotions, even while he allowed us to see them. His teammates rallied behind him, his fans came back to him (the fair weathered ones who’d deserted him, that is), even the press praised him. He won over everyone…and got his job back on top of that. He was the ultimate leader. But let me talk Eagles before I lose you. A lot of the steadiness I just described is also what the Eagles found in Doug Pederson’s leadership. Pederson adheres to a sense of realness in his coaching style. He was a player before he became a coach, so he knows what his team is feeling and thinking better than most coaches. Because of that, he makes a point of being visible, available, present. He hangs out with them. He insists on developing culture, relationships. He’s transparent with his team. Since experts estimate that 58% of your performance at work is based on your emotional intelligence, it would stand to reason that it’s a skill we all need, one we must constantly strive to improve upon. This builds trust and comfort, which is crucial for every team. Trust is the foundation for success. If you’re looking for ways to build more trust and a stronger team mentality, there are some tips for how the Eagles did it and won the Super Bowl here. 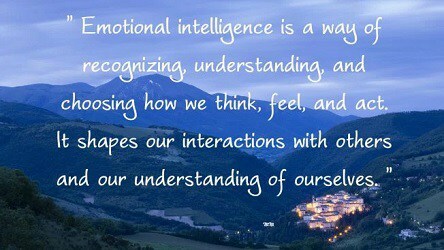 Practicing and honing your emotional intelligence will serve you, your family, and your family business well. Be patient with yourself if the skills don’t come quickly or easily. Progress, not perfection. We urge you to celebrate your small successes with the same fervor that you celebrate the large ones. Moving forward, no matter how small the step, is still forward. As for football, I promise not to take it too personally if you give me a hard time about being a Giants fan; I welcome your comments! I have embraced the fact that I’m living in enemy territory now…in fact, I’ve even supported the Eagles on our Facebook, Twitter, and LinkedIn accounts, as most DVFBC employees and Member families alike are Eagles fans. If you can’t beat ‘em, join ‘em, right? #FlyEaglesFly.